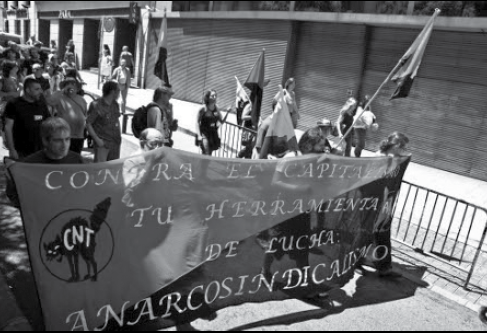 An article by José Luis Carretero Miramar on austerity in Spain and the response. It is evident that the social situation in Spain has arisen in an uncontrollable dynamic. As a result of an unprecedented financial and economic crisis, the productive and social dismantling caused by the government’s Plans of Adjustment imposed on the population is reaching unsustainable levels. The equation has been simple: the gigantic Spanish construction bubble, swollen at its base with private external debt by some extremely voracious financial entities, aligned with a political class that is a product of the reform without rupture of franquismo, of which consisted the so-called “democratic transition,” has burst with the heat of the global financial crisis of 2007. Its implosion has been confronted, moreover, with distinct mechanisms of the socialization of said debt, like the European line of credit of €100 billion conceded to rescue the banks, and indirectly guaranteed by the state. Basically, they are trying to make the whole of the population (and, principally, the working class and the most vulnerable sectors of the middle class) pay for a debt that has risen to a difficult to determine amount, but impossible to repay. In these moments, the Plans of Adjustment implemented, which follow the neoliberal orthodoxy, are causing a complete collapse of the basic pillars of the so-called Social State (which, as an aside, never actually developed toward European standards in Spain), with an absolute lethargy of economic activity which is expressed in devastating statistics like a year-to-year sales decrease of at least 12.6 percent or a decline of state revenue intake by close to six points of the Gross Domestic Product (GDP) in the last year. Of course, this suicidal (because it becomes evident that the debt cannot be repaid) and profoundly antisocial strategy is having undeniably radical effects. The unemployment rate has exceeded 25 percent of the active population; close to 20 million people (more than 40 percent of the population) live in economically precarious conditions; there are 1.7 million households with all of their members unemployed; and 63 percent of said unemployed no longer receive any benefits. On top of that, the bursting of the real estate bubble has pushed a catastrophic situation on a large part of mortgage debtors who bought a house at the height of the cycle and now, in light of the explosion of the unemployment and the economic lethargy, cannot pay. There are over 500 evictions daily, with more than 95,000 in the last six months, and the suicides of people evicted from their homes are beginning to multiply. Not everybody, of course, loses with the crisis: the historic gap between the parts of the national renting market in the hands of wage earners and in the hands of the business owners is rapidly closing. Wages in 2006 stood at 47.26 percent of GDP, and the rate of profit at 41.43 percent. In the last quarter of 2012, the difference has virtually disappeared, since wages now stand at 45.3 percent and corporate profits at 45.2 percent. In that respect, one must keep in mind that more than 90 percent of the private debt that is being socialized and, as such, paid by all tax contributors, belongs to the financial entities and the large businesses of the IBEX-35 (the benchmark stock market index of the Bolsa de Madrid, Spain’s principal stock exchange), while 85 percent of employment corresponds to the small and medium businesses that are severely suffering from the implemented Plans of Adjustment. Furthermore, the austerity measures put in place unload their weight on the weakest: pharmaceutical copay; the privatization of hospital and ambulatory management; the disappearance of health benefits for irregular immigrants; education cuts expressed in thousands of firings and a rise in tuition at the universities and technical schools; repeal of the Dependency Law, destined to favor people caring for disabled people; the expulsion of hundreds of thousands of public sector workers and accelerated privatization of state businesses and services; labor market reform that implies an almost chaotic drift toward a flexibility without brake and a clear reinforcement of business command; the dismantling of collective bargaining, prioritizing its decentralization and the possibility of lowering its conditions at the will of the boss. All of this appears to constitute an enormous offensive that wants to profoundly transform the basics structures of Spanish society. Of course, resistance has come quickly. Following the surprising and magnificent eruption of the discontented multitudes in the streets on May 15, 2011, the demonstrations and protests have become massive, although, too many times, disconnected and disorganized. We are part of the formation of a parallel social block constructed in the environment of the assemblies of the 15-M Movement (the movement in favor of a new constituent process), the struggles against privatization and the affirmation of the radical sectors of social movements and the labor movement. At the same time, the major unions, tremendously bureaucratized, try to maintain their power through a strategy consisting of putting themselves at the head of the mobilization: when the rebellious wave rises, wearing them down and impeding their coming together, and abandoning them when the wave falls. These conditions impose the necessity of constructing, creating and maintaining an open and conspiratorial position that permits building a grand alliance that raises the foundations of the beginning of a process of social transition, whose necessity is each time more shared in front of the global and ecological crisis in progress, toward another mode of life and of production in which the dignity and the freedom of the masses is the center of a vital transformational experience.